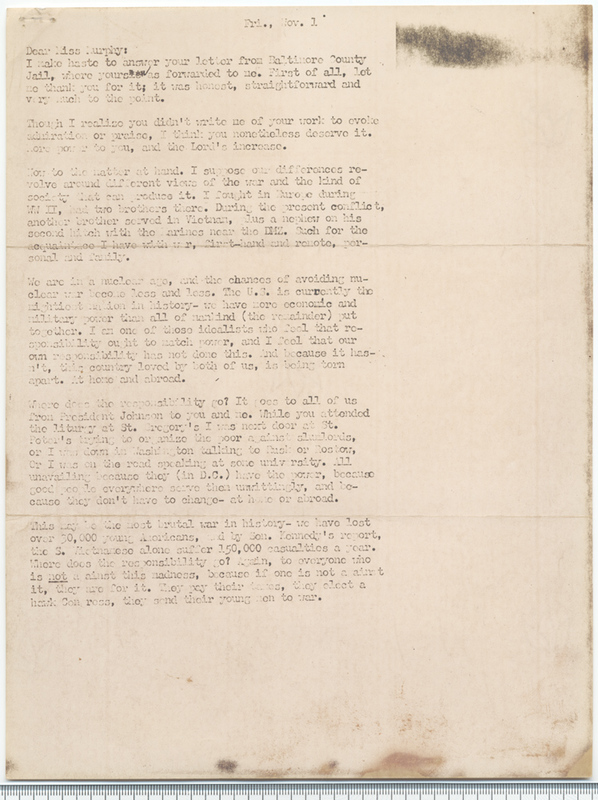 A copy of a letter written on November 1, 1968 from prison by Philip Berrigan to Miss Mary Murphy (Mary E. Murphy's daughter), in response to her letter. very much to the point. admiration or praise, I think you nonetheless deserv it. More power to you, and the Lord's increase. apart. At home and abroad. the liturgy at St. Gregory's I was next door at St.
cause they don't have to change- at home or abroad. the S. Vietnamese alone suffer 150,000 casualties a year. hawk Congress, they send their young men to war.